With fall quickly approaching and fall styles already out in stores, there’s really no way to avoid starting to purchase transitional wear that will take you from the end of summer through fall. Above are several pieces that can be worn now and in the fall, too! I’ve explained the 10 pieces below and why they are each essentials for transitional wear. I have been eyeing this utility jacket for a while now. It’s super soft and you can never go wrong with olive green for the fall and winter months! I especially love the loose shape it has. I’ve seen so many utility jackets out now but this one is unique and can be worn now or in the fall with a blanket scarf and boots! I absolutely love the color of this bag! Louise et Cie makes some of my favorite handbags and shoes, so it’s no surprise that this one caught my eye as soon as I saw it. It also comes in black and a gorgeous mint color. My favorite is the tan because, well… because that’s the color of the majority of my bags! It also has a long strap so you can wear it comfortably on your shoulder if you’re on the go. This color is perfect for fall. You can never go wrong with scarves during the fall. I actually love to wear scarves during the summer (when it’s not 100 degrees out) with a light T-shirt. This scarf is perfect because it is lightweight and is a pretty print! When you don’t really know what to wear, scarves are great accessories to just throw on over any outfit to make it look a bit more unique. I have these lace-up sandals and they are the epitome of perfection. They go with just about everything and are so comfortable. I usually don’t wear sandals with shorter heels but this heel is a great height. It’s comfortable to walk in all day and really doesn’t hurt your feet. I’m flat-footed so having a wedge/heel sometimes helps with my back. They come in several colors and can be worn now with a summer dress or ripped denim shorts and can also be worn later with jeans! I’ve been eyeing this blouse ever since it came out. I love anything with stripes but this one really caters to the tie-neck trend that’s really popular right now. The back has the prettiest pleats and it comes in several prints/colors. I think the grey combo is very Olivia Palermo! I’m not sure which one I want to get but I know for sure I can wear this now with white jeans and then in the fall with dark denim and booties. These booties look just like the Rag & Bone booties but they are much less $$$. They’re the same brand as the lace-up sandals, so I can guarantee you that they’re super comfortable! The reviews say that they run small so make sure to order the next size up! How cute will they look with leggings and dark denim in the fall? The perfect transitional booties! You can even wear them with denim cutoffs now. I am really loving this cardigan. This is another one of those transitional pieces that you can wear now and through the fall and it comes in several colors. I really love that it’s loose-fitting and neutral. I would definitely wear this with a plaid scarf, leggings and OTK boots in the fall. And you can’t beat the price point of under $50! BaubleBar makes my FAVORITE jewelry, ever. And you can’t beat the price point. 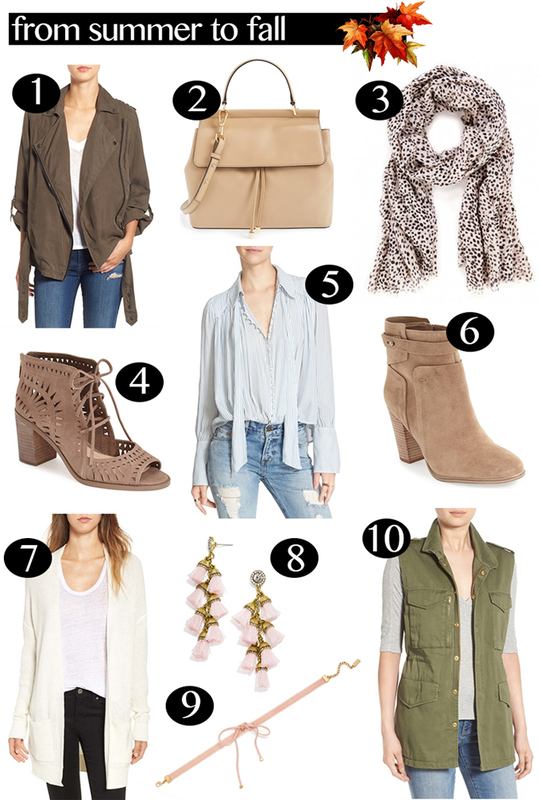 Blush is really in right now and it’s also a great neutral for fall. This blush choker and these blush tassel earrings are great accessories to spice up any regular outfit. How cute would the choker look with the cardigan and some dark denim? I love having simple pieces in my wardrobe and this choker is definitely one of them. It also comes in black! Then the fringe earrings are so pretty. They’re even perfect for holiday seasons, gifts and events! They’re also really lightweight. In my opinion, you can never have enough utility vests or jackets. I have three utility vests (probably one too many) and I wear them so much! I wear them during the summer, throughout fall and winter, too. I love to wear a utility vest with a plaid top and jeans, leggings and a sweater, the options are endless. This one is especially great because it’s under $60! This is an updated version of one that was available last year and I love it. I can’t wait to bring out my utility vests (maybe next week!). What do you consider great wardrobe items for transitional wear? I would love to know! Can Fall just get here already?! I’m over summer! I’m not ready for summer to end. ????. I do, however, love top #5!!! Love everything, especially that utility jacket! This makes me so excited for fall! Pretty sure I need everything on your list! Great picks!! I love that vest! Great Picks!! I’m def in the market for a utility vest this fall! Obsessed with all of these picks! I’ve been eyeing those sandals for school. I think they are so cute but love the lower chunky heel that makes them easy to walk in! love all your picks! i can’t wait for fall weather. Love your picks! I’m definitely picking up those fringe earrings! Love everything! Especially those shoes! loving all of these items!